Download your copy of the Yachting Monthly winter laying-up checklist here. Ensure your mooring line isn’t going to chafe. Preferably use chain and run it through hosepipe. Add a second, fall-back line. Remove as many items as you can, including sails, cushions, curtains, clothes and bedding. Parking up at a nearby marina during this operation can save precarious dinghy trips. Leave lockers, bin lids and sole panels open. Remove any food, empty the fridge and leave the door wedged open. Pump the toilet dry after flushing with fresh water. Deodorise and clean the holding tank if you have one, then leave it empty and dry. Empty all water tanks (don’t forget the calorifier if you have hot water) and run the pipes and pumps empty. Empty and sponge out the bilges. Clear cockpit and deck drains. If you need power on board – to run an automatic bilge pump, say – then fit a wind generator to keep the batteries topped up. Disconnect, clean, grease and reconnect battery terminals. Disconnect any unnecessary cables to avoid any power drain. Ventilation is essential in keeping the boat free from damp and mildew. Create or install a few weatherproof, secure vents. If you don’t have all-weather vents on hatches, fitting them will make all the difference. Flush out headsail furler swivels with fresh water. Take flares home to dry-store. Disconnect the mast wiring. Clean it, coat it with silicone grease and reconnect it. Remove all running rigging, wash in fresh water, dry and hang below or at home. Remove all sails from spars and furlers. Take off any external navigation instruments, such as chartplotters (if possible) and store inside the boat, or at home. Top off your fuel tanks to avoid condensation forming and thus help to prevent diesel bug contamination. Check and clean navigation light terminals. Daub them with silicone grease to prevent poor connections. Keep your batteries charged by fitting a two-stage shore power battery charger with a maintenance level charge. Ensure any shore power lead has an integral protection breaker and preferably fit a galvanic isolator to protect your through-hull fittings from corrosion. If your boat doesn’t need 12 Volts, disconnect and take your batteries home to clean, top up if necessary and keep on charge. Place a small oil-filled heater on board with a thermostat and set to low. A dehumidifier is useful if your boat is particularly damp, but otherwise a little heat and good ventilation will keep her sweet. Service and shut seacocks – or remove the hoses and leave them open for extra ventilation (warning: leave a note somewhere obvious to remind you to replace them before launching). Take transducers out for added ventilation (see warning above). Stuff a rag up all the skin fittings and the exhaust (see warning above). 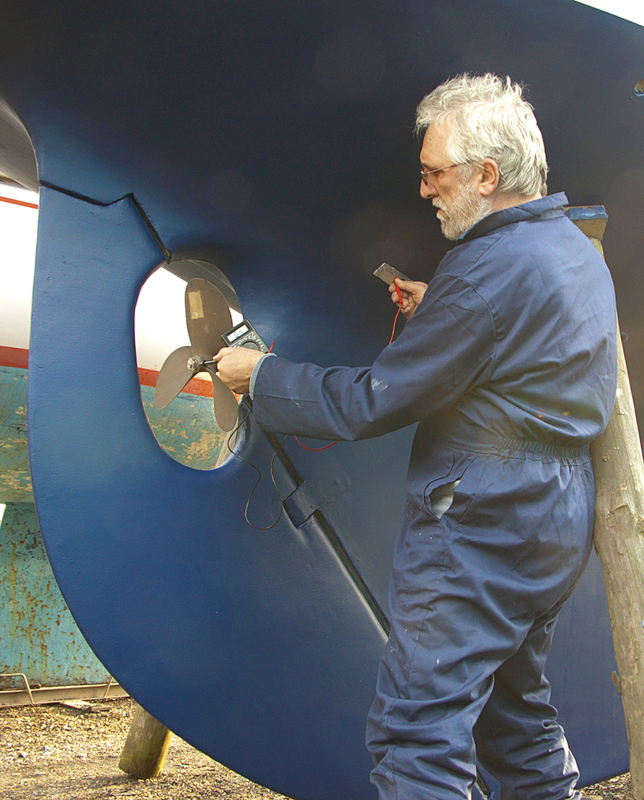 Remove fenders to stop them scratching the topsides in the wind. Grease all rigging screws and replace all split pins. Unstep the mast at least once every three years and check it thoroughly. Remove the anchor and chain from the anchor well or foredeck to prevent its weight distorting the hull. This is very important for wooden yachts.